3 weeks of Whole 30 down, and going strong!! If you were following my Instagram last week, you probably noticed that I am on a bit of an Indian kick. I made Practical Paleo’s Chicken Tikka Masala on Sunday, transformed my Mini Meatloaves with Indian spices mid-week, and yesterday, I cooked up this Chicken Saag dish. I cannot explain the sudden craving for all things Indian, but I don’t think I need to anyway because Indian food is awesome!! It is incredibly delicious, but can also be really healthy. The amazing spices in Indian food (turmeric, ginger, cumin, cardamom, coriander etc) have been shown to protect against some cancers, Alzheimer’s and have anti-inflammatory healing powers. So eat up! When eating out, it is not always clear what all is being cooked up in your Indian curry… I found forum upon forum recently with people asking if Indian Food was “Paleo” with about one-thousand different responses, all with different points of view. My takeaway was that the only way to be 100% sure that your curry is either Paleo or Whole30 compliant is to make it yourself! Don’t be intimidated! This recipe is relatively quick, packs tons of spices in and comes in just under my $5/serving budget! A quick budget tip.., be careful when purchasing spices as some of them can be really pricey! Pay attention to the price tags and look for the cheaper, store brands when you can. Trader Joe’s only carries a few spices, but they are all insanely well priced so stock on what you can there and get the rest elsewhere. If you aren’t paying attention the price tag on this dish could quickly skyrocket! 1. For the Saag, start by slicing the chicken into bite size pieces and marinade with lime juice, chili powder, salt and pepper in a medium sized bowl. Set aside. 2. Place spinach and cilantro in a food processor to finely chop. You could do this by hand if you do not have a food processor, but bring your patience as this is a lot of spinach! Set aside. 3. Finely chop the onion and garlic, and grate the ginger. Go ahead and chop the whole onion now, and reserve 1/4 of it for the cauliflower rice in step 9. 4. Heat the coconut oil in a large pot over medium-high heat and add the onion. Sautee for 2-3 minutes and then add the ginger, garlic and spices (cardamom, red chili flakes, cloves, cumin and coriander). Continue to cook until the onion are translucent, about 5 minutes. 5. Add the tomatoes and cook for an additional 2 minutes. 6. Add the chopped spinach and cilantro and the salt. The greens will wilt and begin to release liquid, once this liquid starts to boil, add the chicken. 7. Cook for an additional 15 minutes, or until the chicken is cooked through and then remove from the heat and stir in the coconut cream. 9. For the rice, chop the cauliflower into small florets and pulse in a food processor to “rice”. It you have never done this before you might want to check out this Everyday Maven page for the play by play. 10. Heat the coconut oil in a large pan over medium-high heat and add the 1/4 onion. Cook for 2-3 minutes and add the cardamom. Cook for an additional 5 minutes or until the onion is translucent. 11. Add the cauliflower and coconut cream and cook until the cauliflower is softened and the liquid has been absorbed. 12. 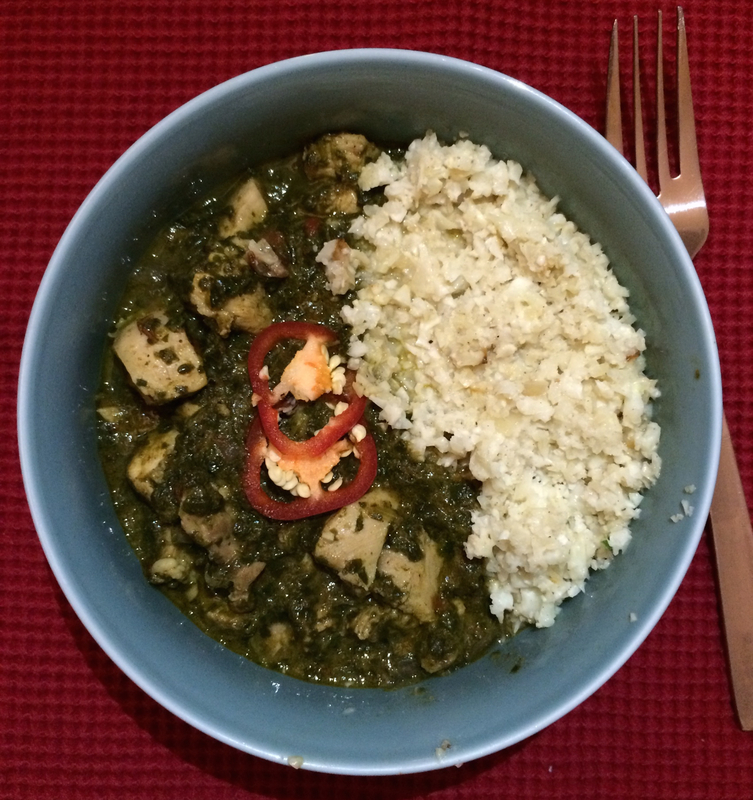 Serve the Chicken Saag over a bed of the rice. Enjoy! Tags: 45 - 60 minutes, Chicken, Gluten Free, Paleo, Primal, Under $5 / serving, Whole 30. Bookmark the permalink. I’m still on the fence about trying cauliflower rice, I’m afraid it will come out mushy on me!